Synopsis: It's the start of the new school term and Nagi is unusually enthusiastic this morning. She compliments Hayate on the breakfast that he'd prepared and after eating... promptly looks herself in her room with a "None Shall Enter" sign. Lady Nagi is all ready to go to school! 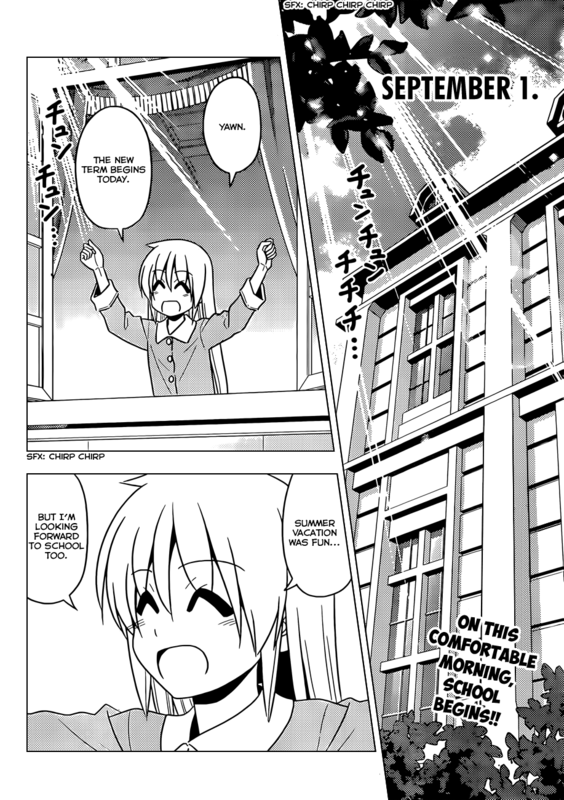 Of course, Hayate will have none of this and he somehow manages to coax her into coming to school together. 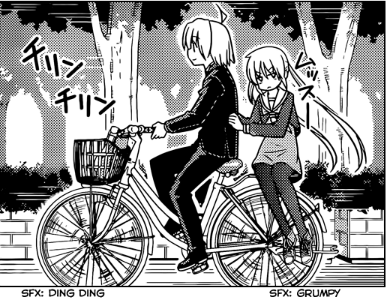 They ride to school on a bike with Nagi sitting behind Hayate with a grumpy look on her face. ... is what she wants you to think. At school, the Hakuo baka-trio along with Kayura and Chiharu are discussing Hakuo's school trip and Chiharu says that she's fine with anything as long as it's together with everyone. Aika asks her if she's sure about that because the school trip this year will be one of Hakuo's five traditions as suggested by a certain Hakuo Board Member named Kananiwa-sama. Hinagiku makes the official announcement and basically, the students get to choose what kind of school trip they want based on five levels. Level 1 is an overseas trip that requires 3 million yen in pocket money. Level 2 is the same but requires only 1 million yen. Level 3 is a trip to Kyoto and Okinawa that requires no extra money. Level 4 is basically working at a factory in Chiba with a trip to Disneyland on the last day. They look great together - so there! Hinagiku introduces Kananiwa-sama to make the announcement for Level 5, which turns out to be some kind of challenge at a secret location for 10 days and 10 nights with a prize of 150 million yen. Those who drop out can just spend time at the hotel. Isumi almost snipes the King's Jewel that Kananiwa-sama is using as an earring and she consults with Athena on that matter - to which mini A-tan says that she'll need to consult with Mikado. Nagi sees this as an opportunity to drop out early and just chill at the hotel and thereby extend her vacation time. Hina sees this as an opportunity to pay off Hayate's debt... and perhaps win his heart in the process... or at least allow him to play the field. Meanwhile Miki says she's choosing whatever Hina's choosing and Izumi and Risa are probably tagging along, while Chiharu says that she'll just choose what everyone else is choosing because... FRIENDSHIP! Review: Well, I guess CTMEOY has now been officially de-canonized. Lots of interesting stuff going on in this chapter, but ultimately, it's all just build up for the new arc (as promised in the previous chapter) and it seems it will involve a new King's Jewel as well as Hayate's debt. Isumi: King's Jewels... gotta snipe em all! 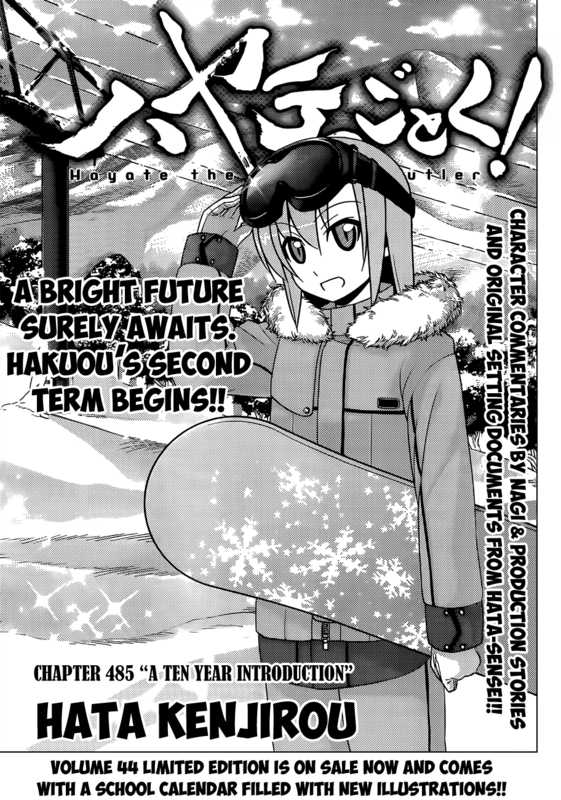 Not much to say about this chapter as I'm not really into following the plot-heavy stuff of this manga. 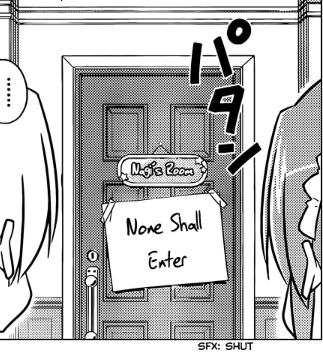 I did enjoy Nagi's little charade and the "None Shall Enter" sign afterwards though. Gotta admire her zeal for laziness. 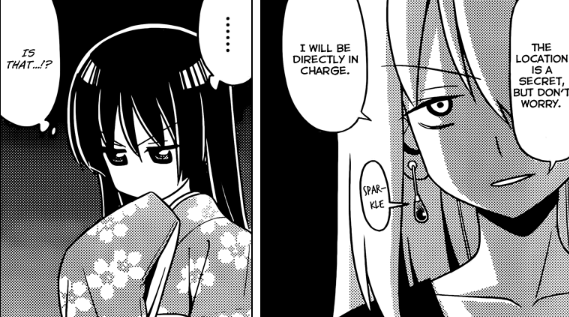 Oh, and Kananiwa-sama looks totally evil with those eyes, by the way. I suppose she'll be the new main villain for this arc. I wonder if she has any connections to Hisui, Himegami and Athena? Speculation Corner: This chapter had me thinking about Mikado and what he wants to do with the King's Jewels or with the Royal Garden and the power of the king. Anyway, my wild speculation would be that he wants to use that power to somehow revive Yukariko, since I can't really see any other clear motive for him otherwise. One might argue that he'd been hunting down the Royal Power even before Yukariko's death, but it'd be easy to explain away by saying that he might have been trying to find a way to save Yukariko before her death and now he's just changed his goal to reviving her instead. Like I said, this is a wild speculation, so I won't bother to quote any chapters or references in this manga. Feel free to look them up yourself if you think this speculation has any merit. Fanart Corner: This is actually a preview for the main(only?) image of a little scenario/fanfic that I'll be writing and posting here over the weekend. 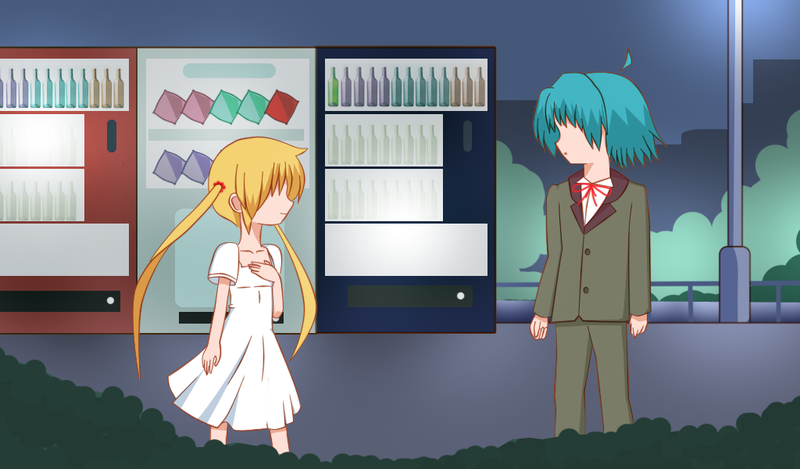 Thanks to György Kovalcsik, Chloe Noir, Epsit Ghodke and everyone else from the Hayate The Combat Butler fan group on Facebook for all your suggestions about this particular drawing. Watch out for my new fanfic/scenario, "Sore Ga Ai Deshou?" This Weekend! I don't know if this makes CTMEOY non-canon in terms of them learning about Nagi's father. After all, that anime took a lot of stories from manga chapters and incorporated them into it. Last week, Hata-sensei made reference to Heaven is a Place on Earth. Granted, I don't remember all the details on CTMEOY, but I thought they went on the trip after the school term started. I figure at some point, Hata-sensei will make a casual reference to CTMEOY in some form without getting bogged down in the details. Hmm... good point. I took a screenshot from CTMEOY and it seems it starts at 9/18 http://postimg.org/image/yv9lvqds3/ ... if so, then there might still be some time from the start of the 10 day trip and the start of CTMEOY - and hey, if it's made at least partially canon, that's great news for me :). The trip to Las Vegas was during Silver Week and surely there is still time to incorporate CTMEOY into the manga plot. However, there are a lot of problems with the continuity from school uniform to Dolly to Kurotsubaki. Shin, on the other hand, is not a problem. The Kurotsubaki seems to be the only real writing challenge, I'd say. What's the problem with Dolly, though? If we say Kananiwa resembles Dolly then surely when the main cast sees Dolly after the school trip they would comment on this. But there is no hint about that in CTMEOY. 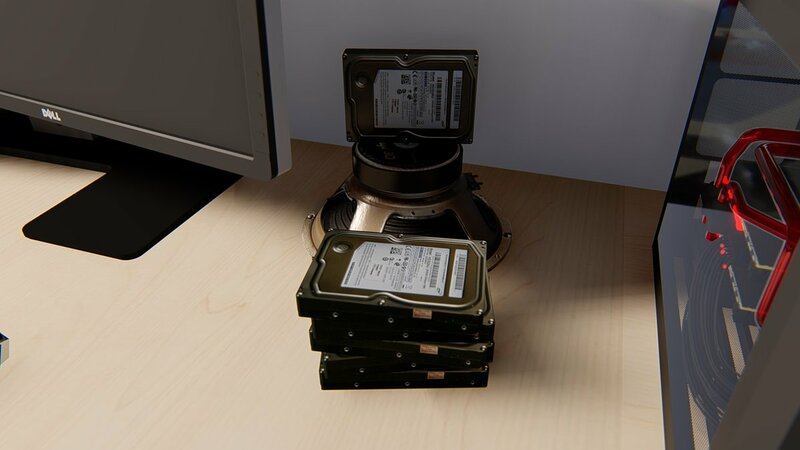 Ah, I get it. I didn't think she looked like Dolly myself though. 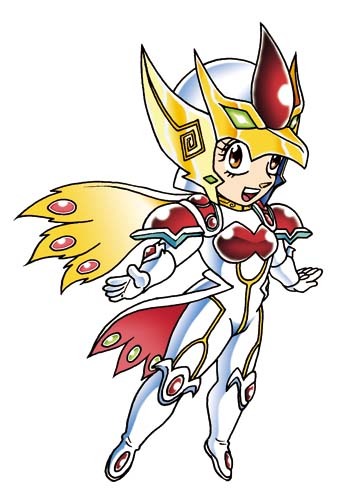 I did see a resemblance after someone mentioned it in your blog... but I'm not sure if it's intentional or just Hata running out of "evil female character" design ideas. I postulated that if this is Dolly (and I didn't recognize that until someone pointed it out, after which I think this could well be Dolly), then she might have used magic to make everyone forget. The other possibility, which I like but don't think will happen, is that Hata-sensei simply uses the CTMEOY story elements relating to Dolly, Shin, etc. and makes them work with the manga by retelling the story. Thus, the Level 5 trip might end up being a trip to Las Vegas. As I said, I doubt that's how it goes, but I would enjoy it.